As owner of CrazyHorseWest.com I would like to take a moment to introduce myself and share some of my past and current ventures with you. 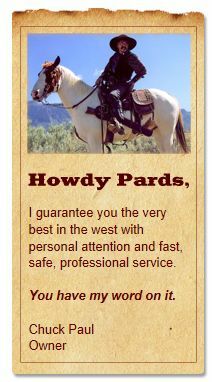 My name is Chuck Paul, and as a professional in the Western Industry, I'm dedicated to providing my customers with the best in Western products. CrazyHorseWest.com is determined to bring the best in customer service and the highest quality products to everyone. Let’s face it, we all know that shopping online is far more convenient for everyone, so why not let me bring these industry leaders in Western manufacturing to you? Be sure to visit our site regularly, as we frequently locate new and exciting Western products. We want you, our customers, to be as excited as we are. We would love to hear any suggestions or comments you may have for us. We hope that you’ll enjoy your visit at CrazyHorseWest.com.